The overall lack of variety from one track to the next makes 'Wishing Well' a very one-dimensional affair. E.Z. 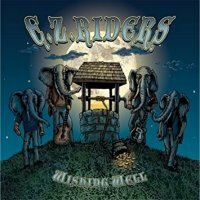 Riders (an acronym for "Experienced Zydeco Riders") is a Southern Rock outfit who have been active since 2007 and are poised to release 'Wishing Well', the fourth full-length album in the band's history. One sample of their music will have you thinking these guys are from the deep south of the United States, but in fact they call Italy home. Similar to that of Erik Johnson (Bombay Black) and solo artist Luke Gasser, Ivano Andreozzi's rough-hewn voice and Southern-tinged accent fits perfectly with the music. They deliver their brand of Southern Electric Blues with a no frills, blue collar approach. The tempos are laid back and the band cruises through the set of ten songs without much fanfare. Collectively, E.Z. Riders possess a conservative musicianship that is competent enough with which to present their songs, yet lack the confidence and authenticity when compared to other established acts synonymous with the genre (Lynyrd Skynyrd, The Allman Brothers Band, Widespread Panic). The music suffers largely due to Andreozzi's limited range, forcing a majority of the songs to be written in the same key. Although guitar solos are in short supply, the slide playing on the album's opener and title track is quite enjoyable, yet its contribution is relegated to a single song. Unfortunately, '...Well' is largely a disappointing affair. The band and album are a bit too unpolished in the major areas (song-writing, musicianship and production) that would otherwise improve the band's impact on the scene. The overall lack of variety from one track to the next makes 'Wishing Well' a very one-dimensional affair and not compelling enough to make it truly worth seeking out.